He’s more machine now than man. Twisted and evil. Obi-Wan may have been remarking upon Vader's lost humanity more than anything else, but it got me thinking about Vader's physical being anyway. Exactly how much machine and how much man are we talking about? But things may have changed for Vader in the years between Revenge of the Sith and Return of the Jedi, such as organs failing and needing to be replaced, as well as improvements to his technological components. At the time that Obi-Wan made his comment (which was in Return of the Jedi ), what was the ratio of man to machine in Vader? Well-reasoned estimates are welcome. Ratio by volume is preferable, but weight is fine too, so long as this is made clear in the answer. We can calculate, roughly, how much of his body was replaced by machine. = only 31.15% machine (i.e. 68.85% man). (This screenshot is while the Emperor is shocking him at the conclusion of Return of the Jedi.) It's supported by his difficulties breathing and speaking without his suit. If this is true, it could maybe put him to about 35 or 40%, but even with that I'm not confident he's "more machine than man" in a literal sense. It was said that, due to the extent of his injuries, he was 80% machine (prosthetics), and a mere 20% human. His legs were severed at both knees, his right arm at the elbow, and the left at nearly the shoulder. His torso is completely human. The graphic novel, 'Darth Vader and the Lost Command' states so explicitly in one of its pictures. Wikipedia also provides this information. Why did Obi-Wan leave Vader on Mustafar? 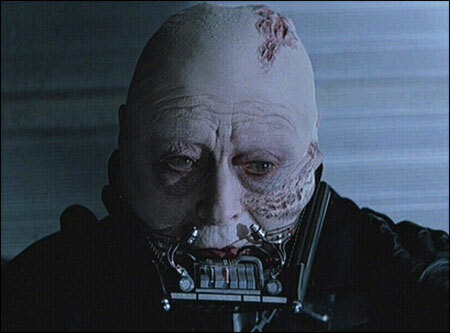 What is the origin of Darth Vader's face scar? After cutting down his limbs, should Obi-Wan have spared Vader of the horrible pain of a slow death in the lava as a tribute to an old friend? How did Palpatine react to Obi-Wan's death?